Celiac disease is a so-called, “autoimmune disease” that impacts an estimated one percent of the population. An auto-immune disease is caused by an individual’s immune system attacking its own tissue. Other examples of diseases that fit this classification are multiple sclerosis (MS), pemphigus, rheumatoid arthritis and systemic lupus. 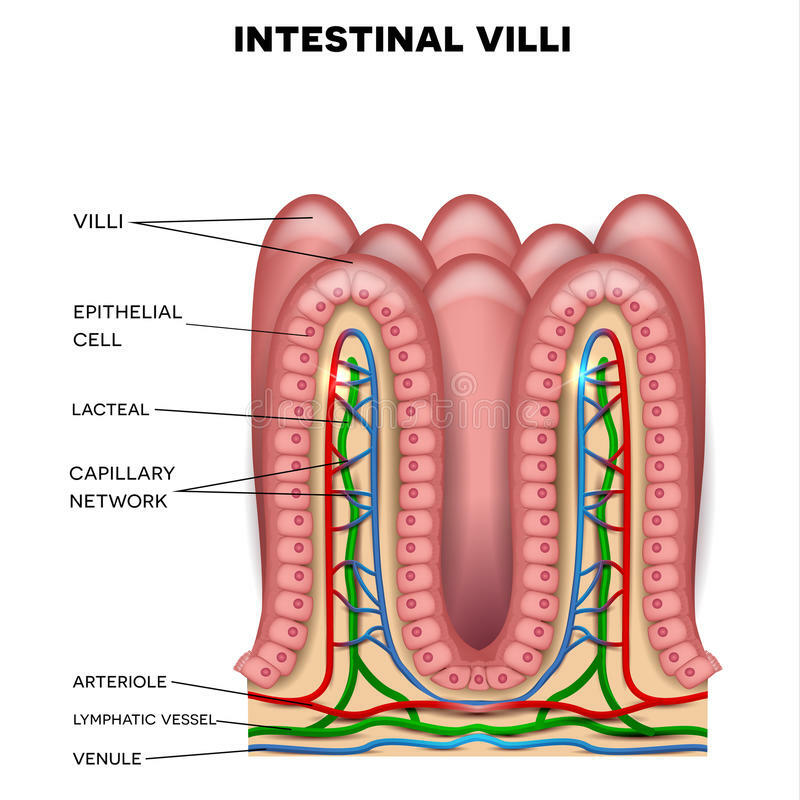 In Celiac disease, the tissue that is impacted involves the microscopic villi that line the lumen of the small intestine. 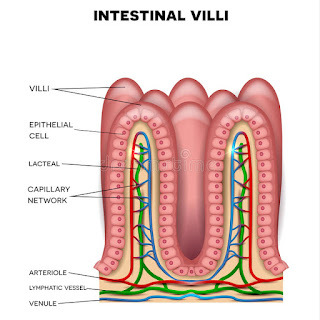 These structures provide the surface area through which digested nutrients are absorbed (see image below). The patient with celiac disease presents with unexplained loss of weight and fatigue, anemia and constipation for example. The destruction of these highly complex structures is irreversible; if, this condition is left untreated, it can be deadly. The trigger for this auto-immune response is the presence of gluten - a protein found in wheat and related plants. Gluten is a protein that is prevalent in Western diets. In addition, research studies have demonstrated that the agent (antigen) that induces the autoimmune response is not the intact gluten protein but the protein after it is modified by the enzyme transglutaminase 2 (TG2) within the small intestine. It seems that in normal tissues, although TR2 is an abundant enzyme, it exists primarily in the inactive state. Chaitan Khosla and his colleagues at the University of California at Stafford have recently demonstrated that there is a cellular enzyme protein 57 (ERp57) that inactivates TG2. Normally, ERp57 is involved in the process of protein folding within the cell. Furthermore, it has been established that ERp57 inactivates TG2 outside the cell within the extra-cellular environment. These data suggest that the etiology of celiac disease may relate to the functionality of ERp57. These findings are significant; for, a more detailed understanding of the biological chemistry of celiac disease may open avenues of therapy that have heretofore remained elusive. 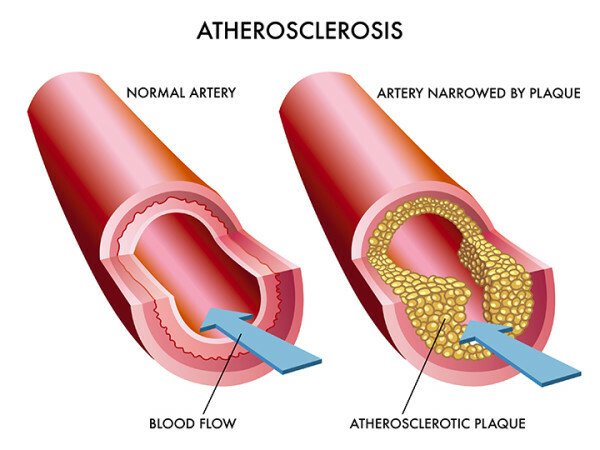 Atherosclerosis is a condition often associated with age that involves a narrowing of the lumen of the arteries usually associated with age (see image below). This condition often leads to coronary heart disease. Traditionally there are a number of risk factors that are generally associated with this syndrome – high blood pressure (hypertension), high cholesterol, heredity, life style, diet etc. 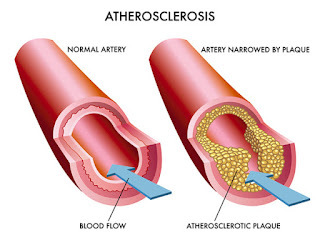 However, a significant percentage of those individuals that show evidence of atherosclerosis have no known risk factors. Research done by Dr. Siddhartha Jaiswal and his colleagues that has been published in the New England Journal of Medicine (July, 2017) sheds significant light on the possible etiology of this perplexing reality. Within the bone marrow, reside stem cells that are so-called, pluripotent cells; they are responsible for the production of the body’s complement of immune-competent cells such as red blood cells, white blood cells including lymphocytes, neutrophils etc. It has been well documented that over the lifetime of the individual these stem cell undergo mutations that can lead to blood – hematopoietic – cancers such as leukemia. Jaiswal and his associates now have evidence that CHIP may be the underlying cause of atherosclerotic cardiovascular disease of no known etiology. The results of their studies indicate that the presence of CHIP in the cell population of circulating blood was associated with a near doubling of the incidence of atherosclerotic cardiovascular disease. Furthermore, the common mutations that were present in CHIP were found to be in the genes DNMT3A, TET2 AND ASXL1. These genetic mutations have also been shown to be associated myelodysplastic syndrome (MDS) and acute myeloid leukemia (AML). These clones seem to be more prevalent with age – more that 10% of persons older than 70 years carry such a mutation. This finding is significant in that it shed further light upon the etiology of atherosclerosis.